Hi all! 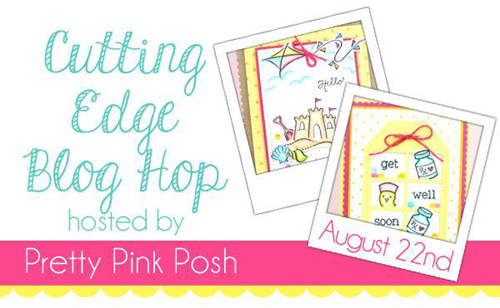 Today we are happy to join the Cutting Edge Blog Hop which is hosted by Pretty Pink Posh. It’s taking place on the Pretty Pink Posh blog. They will have a link-up widget where you can link up your project and then hop along and see what others have created. They want EVERYONE to be involved. If you love adding die cuts to your projects and have a blog, you are welcome to join along. Don’t have a blog yet? This is a great time to start one! In this card we used; Cityscape for the skyline, Inline Letters, Index Card for the speech bubble, Sunny Skies for the cloud and hearts and Pandamonium for the sun. Then we adhered it all to our popular Femme Frames. Mama Elephant is also sponsoring a prize so head on to Paulina's blog and start hopp'in! Die Overload! haha What a sweet card! Love those cute little faces on the sun and cloud. Cute, I love that scalloped border. The happy cloud and sun are such a cute addition! Oh my goodness, what a cute card! So sweet! Love the faces in the cloud/sun. Ca-ute. That cloud is darling. I love the cityscape die. I have it and haven't used it yet. Thanks for the great example. Great card, love that cityscape! 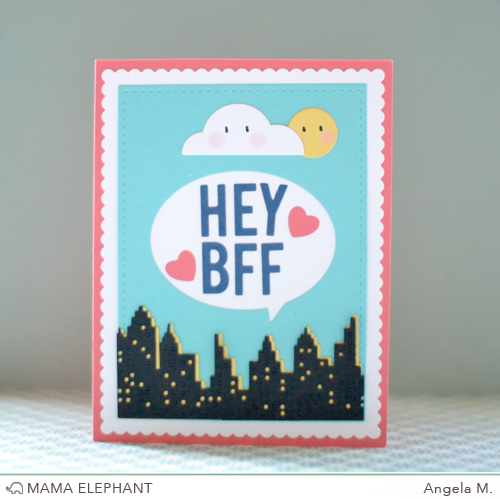 This is super cute...love the color combination and the Cityscape die... Really adds depth! What a cute card, love the it! I love how you added the 'faces' to the cloud and sun! Such a charming card, Angela! Thanks so much for a chance to win! I used my cityscape die just today and love it!! So many possibilities!! Very fun card...love the city skyline and the speech bubble. Ilove how cute this card is - so Kawaii!!!! Lol! How fun is this card! Love the eyes on the sun and moon, so very clever! Super cute--love all the elements! The faces on the sun & cloud look adorable! I love that city scape die...really need to add it to my collection! !